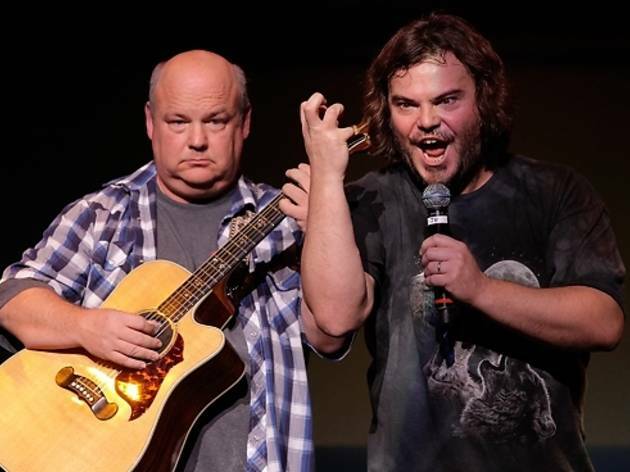 See who's on the bill at Tenacious D's most epic (er, first) music, comedy and arts festival. Tenacious D, self-titled "greatest band in the world," is putting on its first music, comedy and arts fest right here in LA, and we're pretty sure it's going to be the greatest festival in the world. With 25 artists including both heavy hitters (Zach Galifianakis, Adam Sandler, Demetri Martin, Sarah Silverman) as well as local and cult favorites (Tig Notaro, Garfunkel & Oates, Tim & Eric, Neil Hamburger) our stomachs hurt just thinking about how much laughing we'll be doing. Seriously, we might throw up. The festival will take place at the Santa Monica Pier on Saturday, October 19th. Tickets go on sale Friday, June 14 at 10am, and will run you $99 a pop (plus those tricky fees), or $250 for VIP tickets, which get you priority viewing, a VIP bar, special merch and access to "golden" (read: cleaner) toilets. So set your alarms and get ready—we have a feeling both types of tix will go fast.